I'm receiving a lot of nice deliveries at the moment. 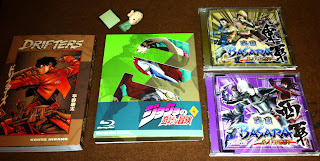 This one included JoJo's Bizarre Adventure volume four, the Sengoku Basara Seigun BEST and Sengoku Basara Tougun BEST CDs, and the first volume of Drifters to go with the volume I bought last week. Oh, and a scary freebie toy from Natsume Yuujinchou. The most exciting part of the delivery is the pair of CDs, since each contains a track from next year's Sengoku Basara 4 game! The full details are in my earlier post here. Their arrival was timely, as the first batch of the CDs sold out at most stores this week. They should come back in stock soon as they aren't intended to be extremely rare. I don't tend to review my CDs because most English-speaking fans just download their copies (it's a little depressing), but I'll make a small exception and put down some quick comments about the new tracks so that I can laugh at myself later when I find out I was wrong about everything. The CD booklets didn't contain any interesting hints about the new game. They did, however, include a few of last year's new illustrations from Browser Sengoku Basara. Some of them were heavily cropped in the game so it was my first time seeing the full versions. The Sengoku Basara 4 track on Tougun BEST CD is Tentei ('Ruler of the Heavens'). After ordering the CDs, I was suddenly worried that the preview songs were going to be extremely short. I was relieved when I saw each was just over four minutes long. The first thing I noticed was that it seemed extremely familiar - it turns out that Tentei is the background music used in the Sengoku Basara 4 teaser trailer (which I may have watched too many times). After the part which is used in the trailer, the melody becomes more beautiful and regal in tone; I'm excited imagining what kind of dramatic scenes it's going to accompany in the game! There is also a previously-unreleased Sengoku Basara 2 track titled Souryuujin ('Twin Dragon Formation'). It's a short, bouncy BGM which I don't remember it from the game, but that's probably because I'm too excited to concentrate on the music whenever I get to go up against Masamune and Kojuurou. Sousei ('Genesis' or 'Creation') is Seigun BEST's Sengoku Basara 4 offering. It's mostly a slow, sombre piece with some majestic percussion, though it does vary later on and become more urgent. I'm not sure what this song will be used for since it feels too emotional for most of the content the game is likely to contain. Of the two preview tracks in the set, this one was my favourite. There are also two additional unreleased tracks from older games. I'm still struggling to place where Sengoku Basara 3's Shukuen ('Fate') is played in the game, which is especially sad as I spent most of the last few years solidly playing it. It's an upbeat, fast song, and wondering about it is going to make me start playing the game again soon. Sengoku BASARA ver. 0 is an almost-unrecognisable take on the series' theme from the first Sengoku Basara. I knew that you would think like that..., well, you're right, so I have nothing to say. Let's just wait until it comes out..